We help our clients reduce investment risk without sacrificing potential returns. We put together the ingredients for your investing success. * https://www.advisoryhq.com/articles/financial-advisor-fees-wealth-managers-planners-and-fee-only-advisors/ - 3Summit charges below industry average fees based on account size below $1m. 3Summit invests primarily in low cost securities. How you invest your money will ultimately determine your success or failure in meeting your long-term financial objectives. 3Summit is an invaluable strategic investment partner to our clients by providing the most advanced investment and risk management capabilities available. Our only incentive is your investing success. We are a fiduciary providing fee only investment management services. We do not sell any financial products including insurance or annuities. We never enter into fee sharing agreements or receive commissions. We provide our clients access to the most sophisticated, well researched investment strategies and risk management techniques available. We design portfolios to perform in any market condition. 3Summit is an independent registered investment advisory firm and not affiliated with a larger investment company, bank or insurance company. Our independence gives us the freedom to provide unbiased investment advice because we do not have to balance your best interest with the profit motivations of a larger organization. The fees you pay matter. We implement our investment strategies using low cost securities. Client portfolios are traded with a low-cost broker and we make sure you understand all the fees you are paying. We design and manage investment portfolios with a level of sophistication and quality not generally available to individual investors. While we can manage institutional investment portfolios of any size, we specialize in helping smaller institutions that do not traditionally have access to the sophisticated investment strategies and risk management we provide. We help you offer your clients a highly differentiated approach to investing that is capable of dramatically reducing the risk of the portfolios under your care without sacrificing returns. While we can manage institutional investment portfolios of any size, we specialize in helping smaller institutions that do not traditionally have access to the sophisticated investment strategies and risk management larger institutions enjoy. We are passionate about helping institutions fund their important missions long into the future. We help you offer your clients a highly differentiated approach to investing that is capable of dramatically reducing the risk of the portfolios under your care without sacrificing returns. We can act as a third-party investment manager or combine our proprietary investment strategies into your existing investment portfolios. Driving performance through superior portfolio design. We believe it is possible to design portfolios to reduce downside risk without sacrificing long-term returns. 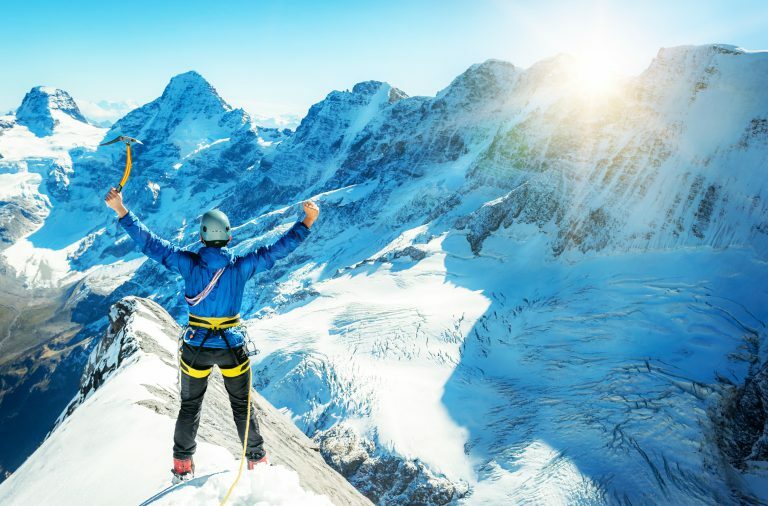 The sophisticated approach to risk management that we provide to our clients has the potential to generate higher long-term returns along with lower potential losses than more conventional portfolios. 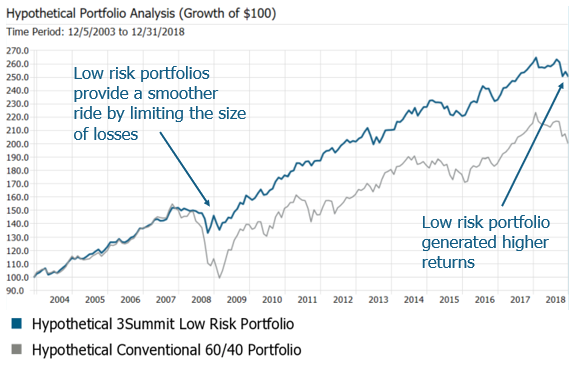 Low risk portfolios outperform over time by losing less along the way…it is that simple. We manage a collection of proprietary investment strategies designed around meticulously researched investment models. Each investment strategy targets a specific and unique source of market returns and we structure client portfolios to include multiple complimentary investment strategies. Adding many unrelated investment strategies to a portfolio adds a powerful additional dimension of diversification not found in conventional portfolios. Strategy diversification enhances the consistency of returns a portfolio is likely to generate because when one strategy is underperforming, it is probable that a complimentary strategy in the portfolio is outperforming, therefore generating smoother returns over time. The asset class allocation to stocks, bonds, commodities and real estate is traditionally determined by evaluating historical risk and returns. The asset classes with the highest historical returns get the largest weightings in the portfolio. This technique creates portfolios that are highly dependent on the performance of stocks. When stocks are not performing well conventional portfolios usually experience significant losses. We determine asset class allocations for portfolios by evaluating how different investment strategies perform during varying financial market environments. We then assign many investment strategies to the portfolio making sure to include at least one strategy that performs well in each of the possible market environments that could be encountered. The final strategy allocation in the portfolio is then calculated based on each strategy’s risk and not historical returns so that each strategy contributes more equally to the total risk of the portfolio. This process of asset class allocation provides another unique dimension of diversification to a portfolio called economic diversification, which is critical to reducing the size of potential investment losses. We do not believe there is any evidence that discretionary security picking as an investment strategy adds value to a diversified portfolio. 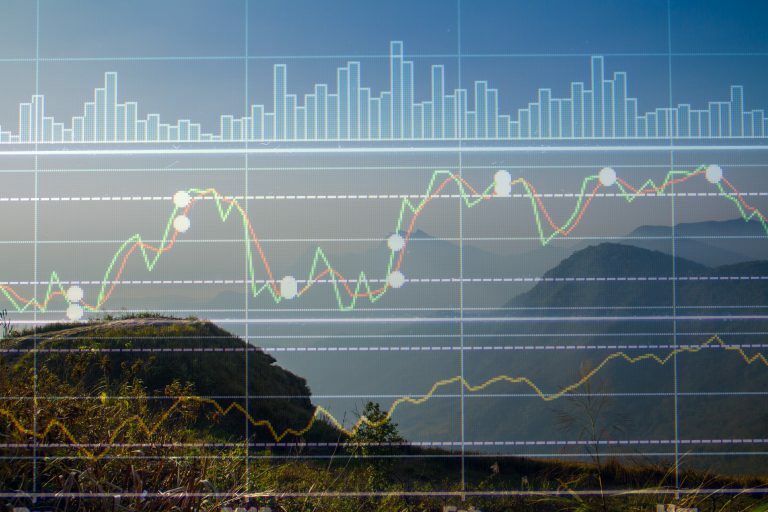 We use our expertise in markets to design comprehensive mathematical models for making evidence-based, systematic and repeatable investment decisions. 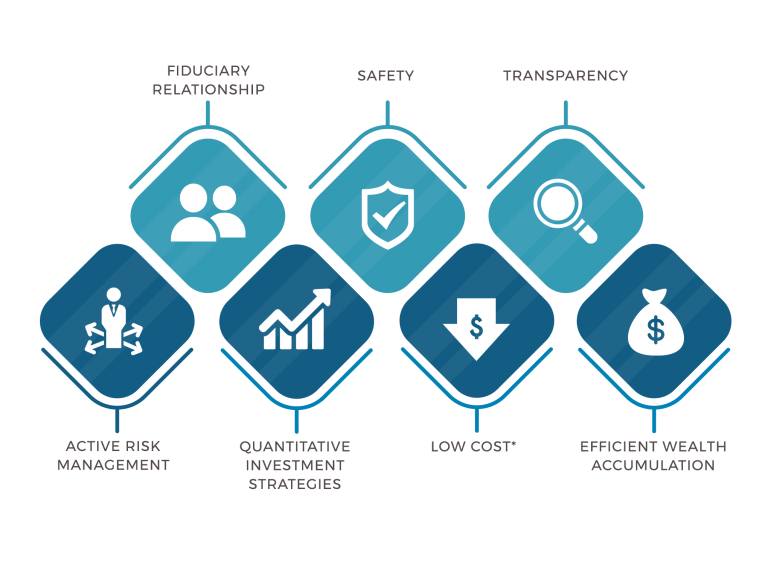 We design investing strategies with a rigid framework of trading rules that can be quantified to enforce consistent investment decision making that always seeks the highest probability of a successful outcome. Our investing expertise is therefore not used to do the impossible of predicting the direction of markets, but instead to design trading rules that are repeatable and consistently applied over long periods of time. 3Summit was founded to provide the clients we serve with an alternative to outdated, conventional investment portfolios. The traditional investment advisory business model and investment capabilities cannot offer investors modern, efficient portfolios that deliver greater wealth accumulation with much lower levels of risk. 3Summit Investment Management was built over more than a decade of investment research and systems development to solve the limitations common within the investment industry. Investment research and technological innovation is at the core of our culture and make the high quality portfolio management we offer possible. 3Summit specializes in constructing multi-strategy investment portfolios that cannot be managed with out-of-the-box commercial investment software. Therefore, we built proprietary portfolio management software to manage the sophisticated, customized investment portfolios we manage. Our technology sets us apart from more conventional investment advisors. We design and manage high quality, quantitative investment strategies that give our clients an edge in the financial markets. We research investor behaviors that drive price movements in the markets and construct systematic investment strategies to exploit the resulting market opportunities. 3Summit is an agile investment firm committed to both educating our clients and staying ahead of the ever changing financial markets. Our culture of research and innovation drives us to understand how financial markets work and continually adapt our technology and investing techniques. We freely share our investment research and philosophy with clients, the public and other professional investors. 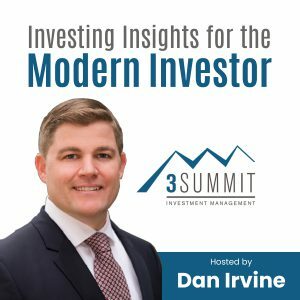 We publish articles, produce quarterly Investing Insight papers, distribute a detailed client letter called Summit View and produce a podcast called Investing Insights for the Modern Investor. 3Summit was founded on the simple belief that trust cannot be earned through talking points or service features. We believe trust can only be earned by structuring an investment management firm to only have one incentive, to act exclusively in your best interest. 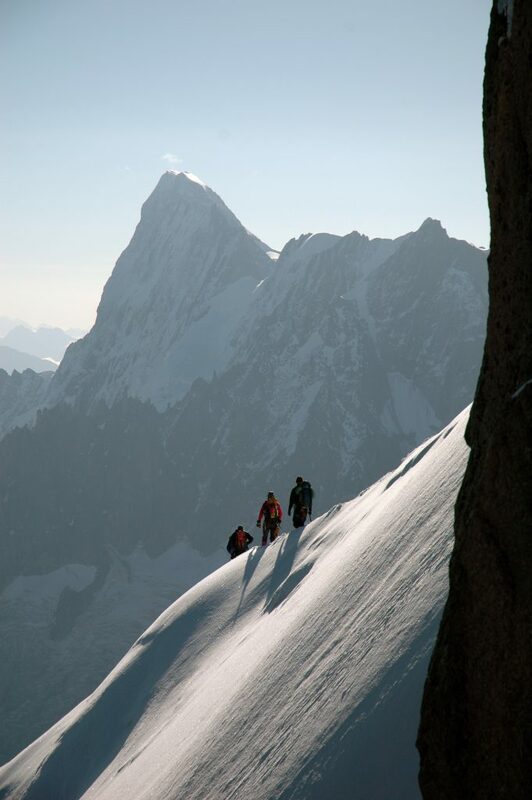 We structured 3Summit to be accountable to our clients and to make that commitment easily verifiable.